Hi, what’s up? Sabia que em Londres também tem escola de samba? :-) Pois no episódio de hoje do podcast Inglês Online, eu falo um pouco sobre uma inglesa que desfila numa escola de samba brasileira aqui na Inglaterra. Hi, what’s up? This is the new episode of the Inglesonline podcast. So have you heard that there are “samba schools” outside of Brazil? Here in London they call it a “school of samba”, actually. It is called Paraíso. How do I know? I’ll tell you all about it. So around October last year I started looking for a place to live in London. That’s because I had to leave my old place, obviously. I put an ad on a well-known website saying I was looking for accommodation and talked to a few people, and checked out a few places. And then an English lady answered my ad and said she had a spare room she would like to show me. She emailed me a few pictures, I liked them… And then we set up a meeting. So when I first met Teresa – that’s her name – face to face, she told me she loved samba and Brazilian carnival and she was actually a member of a Brazilian school of samba in London: Paraíso. I was a bit surprised to hear that. I mean, I know many foreigners who are into samba and Brazilian music, but this lady actually went to samba dance classes every week and participated in an actual “escola de samba”! Just to give you a better idea of just how much Teresa is into Carnival, when she was giving me a tour of the house we got to the dining room and I saw a big yellow Carnival headpiece hanging on a wall. 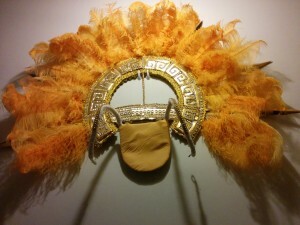 That’s actually a headpiece that Teresa wore in a carnival parade with her school of samba, Paraíso, a few years ago. Yes, Teresa dressed up in costume and paraded alongside dozens of ‘passistas’. The carnival I’m talking about is an annual event in Notting Hill, London. Every year many different groups parade in the streets of Notting Hill, and Paraíso is one of them. They claim to incorporate all the main elements of a Rio carnival parade, although their group is a bit smaller. Apparently in Rio samba schools in the Grupo Especial parade with up to four thousand people, whereas Paraíso puts two hundred and fifty people in the street. So this year I actually went to Notting Hill to see the carnival parade… I didn’t get to see Paraíso though. It was raining, we got there around 2PM and my two friends wanted to grab a bite. So when we finally got to the actual area of the parades, Paraíso had already passed. I got to see a few other groups, though, and listen to their carnival music. I have to say – I’m one of those Brazilians who couldn’t care less about Carnival, to be honest! It’s pretty funny that I ended up sharing a house with an English woman who’s crazy about samba and Carnival. So where do you stand regarding Carnaval? Are you with me, or are you a typical Carnaval-loving Brazilian? Do you know anything about Carnaval in other countries? Let me know in the comments, and talk to you next time! Hi, Ana. Talking about carnival…when I was a teenager, I used to like carnival a lot…my friends and I dance for five days and afternoons at the club, we went to street with our costumes, by afther my 20’s …I lost this ” excitement” now I’am 36 I love to stay at home, to rest, walk go there with my son, pool bath or pic nic around the river…things like that, I don’t like all that noise and crowd.